Format War '06 to run out of arms? You see, the weapon of choice in this conflict is the laser. We all know and love the laser, of course (my affair with it goes back to at least Transformers ). In order to pack more information onto an optical disc, both Blu-ray and HD DVD switched from the infrared laser used in DVDs to a shorter wavelength blue laser. 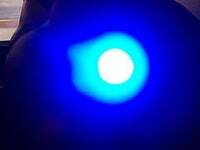 Only now, it seems that the companies responsible for manufacturing the blue laser are unable to cope with the demand. Matsushita and Sony itself, two of the big makers of blue lasers, are suspending shipments of the diodes to other companies. Utilizing BD drives in its own PS3 game consoles, Sony suspended shipments of blue laser diodes to other customers, the makers indicated, adding that only Nichia, Sharp and Sanyo continue shipping the diodes. Nichia, which currently holds 80% of the global blue laser diode supply, reported that its yield rate for blue laser diodes reached 30%, according to the makers. However, the actual output still falls behind the demand, the makers said.